Does assembling a mega-continent necessarily lead to a mega-monsoon? Can you tell by looking at seashells? 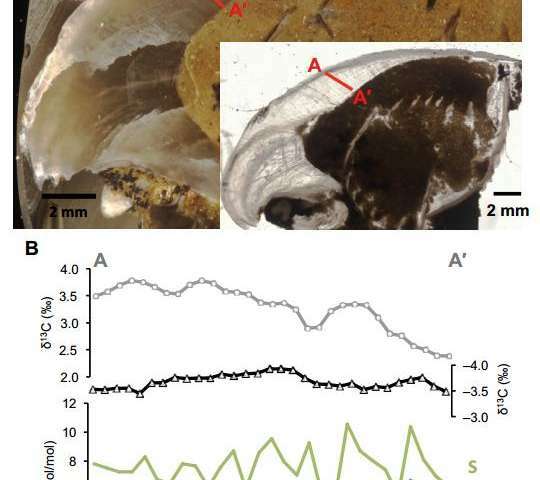 This study by Andy Roark and colleagues tested predictions that the supercontinent Pangea underwent strong monsoons, or massive seasonal changes in wind direction, during times of high sea level (i.e., interglacial) by analyzing the chemistry of fossil brachiopod shells. The shells were deposited in a shallow sea in present-day West Virginia and Ohio in the latest Pennsylvanian (~300 million years ago). By carefully micro-sampling each shell along its direction of growth and analyzing for stable carbon and oxygen isotopes and trace elements, the team reconstructed a record of seasonal variation during the lifetimes of the organisms. The data showed that the region experienced minimal seasonal variation in temperature and rainfall; in other words, at most a very weak monsoon. These results may help resolve a paleoclimate debate about the relationship between monsoonality and sea level and provide a glimpse of changing seasons on an ancient mega-continent.